The Peregrine falcons have started their family early this year. Rebecca laid the first egg just before 4 PM on Saturday, 3/19/2016. Last year, the first egg was laid on 3/27/2015. The second egg of 2016 was laid about 8:30 PM on Monday, 3/21. 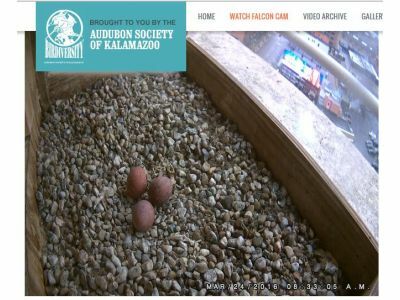 The third egg was present in the morning of 3/24 after a cold and windy night. Rebecca spent the night hunkered down over the eggs, with the wind ruffling her feathers every which way. So, it will take some detective work to see if we can find out exactly when the egg was laid. Both Rebecca and Kewpee have been incubating the eggs. Will there be a fourth this year, as in previous years? We will soon find out!